Children:Cain, Abel, Seth, et al. Adam (Hebrew: אדם, ʼĀḏām; Greek: Ἀδάμ, Ādām; Arabic: آدم, ’Ādam; "Name means::man") (Born::4 Ethanim 1 AM–Died::Tammuz 930 AM), according to the Bible, was the first human being created by God. It is said that man was created in God's own image, and given dominion over the animals and the Earth. Adam and Eve were both created by God on the sixth day of creation. Adam was formed from the dust of the ground. God then created Eve by placing Adam into a deep sleep and removing his rib with which Eve was formed. Adam and Eve then become the progenitors of all humanity. Eden is the name of the geographical region in the antediluvian world in which God created the Garden of Eden (Hebrew: גן עדן, Gān ʻĒḏen). God placed Adam in this garden, and he and Eve were to live there and care for it. 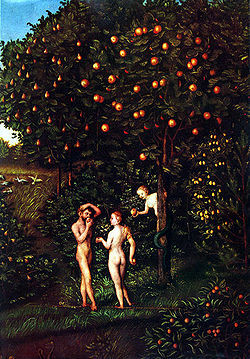 The Garden of Eden is described in Genesis 2-3 . According to the Bible, death came into the world as a result of the sin of Adam and Eve. The account in Genesis 2-3 states that God placed a Tree of Knowledge of Good and Evil in the Garden of Eden, and gave Adam and Eve specific instructions not to eat from it. Despite this command and warning from God, Eve was tempted by a serpent and she ate of the fruit anyway, then gave some to Adam. This act of disobedience was the first time that humans had sinned against God, and is therefore, called the original sin. Creation of Adam, by Michelangelo. Ceiling of Sistine Chapel. Adam lived to be Life span::930 years old and fathered sons and daughters by Husband of::Eve, three of whom are recorded by name: sons Father of::Cain, Father of::Abel, and Father of::Seth. To be more specific, he was Age of parenthood::130 years old when Seth was born. Traditionally, the first-born son is used to establish parenthood for genealogical purposes. But in Adam's case, Seth is used because his first-born, Cain, killed Abel and was cursed by God, and for that reason Seth, not Cain, was the son who carried on the line. This page was last modified on 28 August 2015, at 14:30.